EXCLUSIVE: The WFTDA letters come after FIRS reveals itself to be a legitimate contender for international derby leadership -- and an emerging threat to WFTDA governance claims. The WFTDA, reaffirming its claim as the sole governing body for roller derby worldwide, recently published an open letter to the International Olympic Committee seeking official recognition as such. The WFTDA also published a response to the Fédération Internationale de Roller Sports, rejecting their nascent claim to international roller derby governance. This action comes in response to a series of communications and a recent meeting with FIRS. The last sentence of the letter effectively spells out the ultimate intentions of the WFTDA: Do what it needs to do to gain international recognition as the governing body for roller derby worldwide. Certainly, the WFTDA has been doing its part. Over the last ten years, the WFTDA has led the explosion of flat track roller derby to over 400 affiliated member leagues in more than 20 countries. The MRDA, brother association to the WFTDA for men’s roller derby, has more than 60 member leagues in several countries thanks in part to the WFTDA.1The MRDA has also written a letter to the IOC, supporting the WFTDA claim to derby governance. Additionally, the vast majority of independent roller derby leagues worldwide have adopted the WFTDA rule set as the standard for play. This includes the JRDA, the recognized leader in junior roller derby governance. And while not directly associated with the WFTDA, the international derby community has banded together to put on World Cup competitions for men and women, including the upcoming 2016 Men’s Roller Derby World Cup in Calgary, Alberta, Canada. 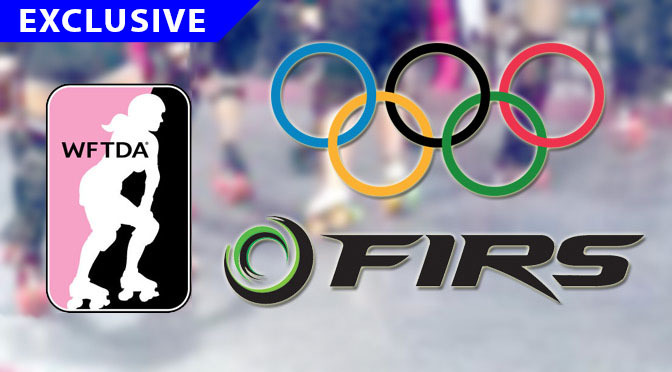 Despite this, the IOC and its affiliated member nations officially recognize FIRS as the international governing body for all competitive roller sports in several disciplines. This authority allows FIRS to oversee 114 national roller sports governing bodies, including USARS in the United States. FIRS recognized roller derby as a discipline in 2011.2After lobbying from USARS, which then allowed it and other national skate-sport organizations to begin the process of organizing and funding specifically for roller derby. Canada, for example, is working on programs to get more funding for roller derby outside of the scope of WFTDA. However, FIRS has not taken any apparent action to build roller derby until very recently. Contrast this with the WFTDA, which has been doing almost everything itself since 2006, and really even before than with the beginnings of modern flat track roller derby in 2002. This difference in actions between the two organizations has understandably led the WFTDA to try and stake its claim in the established international sporting community. With this recognition, the WFTDA can gain the influence, and the access to resources that come with it, to spread the game to places where it is not yet established. The WFTDA wants this recognition so it can do it in a way that benefits the athlete first, above all other factors. This mantra has worked well for it so far. The WFTDA believes that the time is right to expand upon this and take the sport to another level. However, FIRS also believes that the time is right to take its position as the established leader in the international roller sports community to new heights, and is more than willing to use its resources and influence to see that it remains that way with roller derby. It feels it is in a position to start expanding the sport beyond what the WFTDA has been doing — or may be capable of doing — in the years and decades ahead. 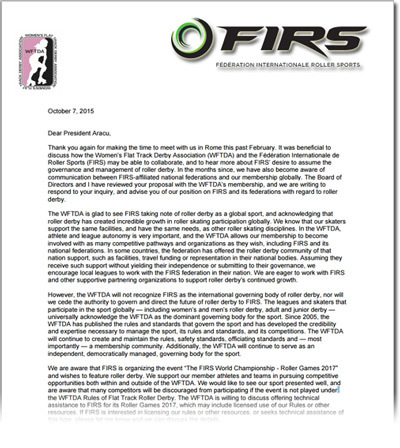 In spite of this, FIRS has started unifying its affiliated national governing bodies, directing them to recognize FIRS as the go-to leader for roller derby in the future. It sees Roller Games 2017, a major centerpiece for FIRS, to be a big chance for roller derby and the other FIRS disciplines to receive a great deal of exposure, exposure that may help expand skating sports to new opportunities. The WFTDA and FIRS have been aware of each others’ positions for some time. FIRS reached out to the WFTDA with a series of communications that started in late 2012, but didn’t get serious until 2014, about how to resolve the impending conflict both in the short term (for Roller Games) and the long term (IOC recognition). These communications culminated on February 2, 2015, when executives of both organizations met in Rome to discuss how the WFTDA could potentially work with FIRS to continue the expansion of roller derby worldwide. Roller Derby Notes was made aware of what happened at this meeting several months ago. 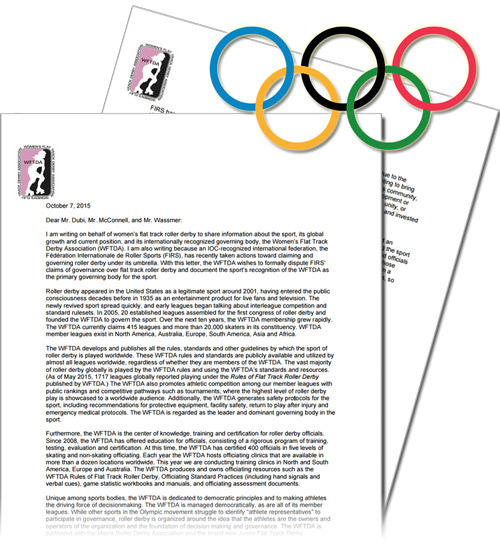 With the WFTDA having issued their open letters to FIRS and the IOC, we are now in a position where we can share the details of the meeting with the public. WFTDA Executive Director Juliana Gonzales, who was present at the meeting, internally shared a “recap and thoughts” summary with WFTDA membership regarding the WFTDA perspective of what happened between the governing bodies. Gonzales also kept direct notes during the meeting, which are referenced in the recap document. Both of these documents are below, followed by our summary. We recommend you read both the recap and the raw notes, which goes into detail too broad to completely capture in this news story. The intentions and goals of FIRS was made very clear early in the talks. Leading the FIRS delegation, FIRS president Aracu began by explaining how the resources and connections FIRS has access to could be a boon for roller derby, specifically citing Roller Games 2017 as an example of the clout FIRS has to unify and produce a global showcase for its varied disciplines. The event will effectively engulf Barcelona, a world capital, for two weeks, as well as be broadcast live on television in numerous countries. FIRS feels that their actions for other roller sports up to this point, which includes being shortlisted for Olympic inclusion, gives it every reason to believe that it could also help roller derby achieve similarly lofty ambitions…provided FIRS dictates how roller derby is presented to a global audience. However, the WFTDA quickly discovered that the way the FIRS wanted to go about doing this wasn’t what they expected, given the leverage the WFTDA had — or thought they had — coming into the talks. “As I prepared for this meeting, it became evident to me that FIRS was talking about a much more complete takeover. In the course of the meeting, it became clear that what they are proposing is that they move WFTDA’s operations, resources, and membership into a branch of FIRS. At the end of the day, FIRS is proposing, in the words of Gonzales and the WFTDA, a “hostile takeover” of international roller derby governance. From the FIRS perspective, it would much easier and much more efficient if the existing WFTDA structure were absorbed into FIRS, giving FIRS a rolling start for its roller derby program instead of having to build up everything from scratch. However, Gonzales also noted that “FIRS made clear in this meeting that whether or not WFTDA joins under the FIRS umbrella, FIRS intends to include roller derby in its World Roller Games 2017 and seek governance of roller derby.” Even if it takes several years, the WFTDA realized, FIRS has the resources to pursue the growth of the sport “with or without” them. The WFTDA countered that if FIRS intends to include roller derby at Roller Games, “FIRS may not get the best athletes or representation of the sport.” FIRS responded that tides can shift over time. It knows that if it can build up stable, well-funded events on the national and international levels, opening up more options to more participants, “athletes [will] have a hard time resisting” them. Though the number of players involved with FIRS roller derby is currently zero, compared to the tens of thousands affiliated with or otherwise relying upon the WFTDA, FIRS is able to take this position because of its power and influence in the international sports community. With more than 90 years of experience, FIRS understands that without unified recognition, it may become difficult for individuals, teams, or even national bodies allied with the WFTDA, to obtain or sustain funding or support from national governments, particularly in countries where roller derby doesn’t have a strong foothold. This additional funding will be absolutely necessary to build the sport out beyond where it is currently. If national sporting federations want to spend significant money to build the sport in their country, or fund their own derby programs (such as the training and travel of teams for recognized international competitions), the first place it will look for guidance on how to best spend that money will be the federation that’s officially recognized internationally. The number of countries that recognize the WFTDA is growing, but it still pales in comparison to the 114 countries that back FIRS. As such, FIRS sees no immediate threat to their potential bid of derby governance. There’s a lot still in play, and a lot of time to play for it. Which is why even with this takeover proposal facing them, the WFTDA did not completely rule out some kind of collaboration with FIRS in the future. Still, the reality of the situation made it pretty obvious that the FIRS and WFTDA views of running a sports organization are very different. “[We] did not go so far as to tell them ‘no, we will not join with FIRS,'” noted Gonazles, “but we did invest a lot of time talking about the fact that the FIRS model presents serious conflict with the values and customs of our community.” The FIRS model, like most other established sports, includes some athlete representation but generally gives decision-making powers to high-level figures in key positions. These decisions are then voted on and ratified by FIRS member nations by in Congress. Long story short, FIRS isn’t as democratic as the WFTDA is. FIRS, specfically Aracu, said flat-out during the meeting that a straight-up democracy, like that in the WFTDA, can be “inefficient and ineffective” in producing strong leadership. This is especially true with the amount of politicking necessary to handle relationships with different sports, the various governing bodies, and among different countries that may have needs which can’t be satisfied by a committee of the whole. As skater democracy is the bedrock the WFTDA, any notion of skaters being represented by or otherwise following policies enacted by someone not of them is “a dealbreaker issue” for any significant level of joint governance between the two organizations. The realization that the WFTDA and FIRS are diametrically opposed on how to govern and grow the sport — the WFTDA, by doing things “differently” and for what’s in the best interest of the participants; and FIRS, by doing things the same as established sports, for what’s in the best interest of all the stakeholders involved4Of which athletes are a small, but still important part. — led the WFTDA to start facing some hard truths about what this means for its own future. Ultimately, the WFTDA decided that it needed to take matters into its own hands. The letter to the IOC seeking official recognition as the governing body for roller derby appears to have stemmed from the revelations gained from the WFTDA-FIRS meeting. This goes a long way in explaining why the WFTDA would seek out the IOC when some in the derby community are pessimistic about the prospects of seeing Olympic roller derby or aligning with an organization that some feel is greedy and corrupt. But as has been the case for decades, the International Olympic Committee is more than just the Olympics; it is the clearinghouse for amateur sports on planet earth. And now, a decade after it was founded, the WFTDA understands that it can no longer ignore this fact. To conclude her summary of the FIRS meeting to WFTDA membership, Gonzales said it was “time we make a choice” about FIRS and its position on growing roller derby. What happened during the WFTDA-FIRS meeting certainly puts the WFTDA response to FIRS in a new light. Publicly, the WFTDA is claiming that FIRS has done nothing and that the WFTDA is clearly the stronger organization. But internally, the WFTDA realizes that with enough time, FIRS is more than capable of doing everything via its broader reach, its greater experience, and its stronger influence. Recent WFTDA actions also take on a different context knowing what it found out nine months ago. Though the WFTDA has been working on initiatives like the broadcast partnership with ESPN3 and the creation of the Junior Flat Track Derby Association5In its letter to FIRS, the WFTDA claims that everyone in junior roller derby “universally acknowledges the WFTDA as the dominant governing body for the sport.” As of right now, that is simply not true; the JRDA is clearly the leader in international junior roller derby, having recently staged the first Junior Derby World Cup. for some time, there’s now the question of whether the WFTDA felt it had to accelerate these plans and implement them sooner than originally planned in order to demonstrate what they could do with their clout, before FIRS did themselves. With Roller Games fast approaching, it is expected that FIRS will begin to make its moves in the international roller derby space very soon. How this will be accepted within the roller derby community — or at least, the independent roller derby community not directly aligned with the WFTDA, particularly outside of North America — is a big unknown. FIRS will want to demonstrate that it will be able to offer more opportunities for roller derby, that it knows what it is doing, and that it is the stronger choice when it comes to leading roller derby into the future. Appropriately, skaters will ultimately have the final say as to which organization (or both organizations?) best suit their wants and needs to play roller derby. Not just the skaters playing the game today, but those that will come into the sport in the future. If the FIRS plans take shape, and the WFTDA continues to grow, they will have more options to play and compete than that are currently available to players now. Which option will they want to take? Roller Derby Notes will keep our ear on the door to the developing drama between the WFTDA and FIRS and report on any significant updates when they happen. The WFTDA is not an on the track product, it is a sports association. Roller derby as a product is what killed the sport in the first place. Want to kill off roller derby again, simply make it a product, package it all up, decorate the skaters, only pay the best looking, dynamic skaters to play, oh and be sure to make thousands of potential players unqualified, yep, that should kill it off just fine. The reason WHY the Women’s Flat Track Derby Association is on ESPN3 and the World Series Of Poker is on The Mothership is because the WSOP has established audience interest (WHY DID HE MAKE THAT BET?) whereas no such connection exists with WFTDA. Well Kelly let me respond by saying this…. Do everyone a favor and take your game to the YWCA and don’t charge people to see it. That way you can stay true to yourselves and not have a pesky audience demanding to be entertained all the time. That solves the problem on both ends.